Looking to perfect your bow and arrow aiming skills? Perhaps we have a solution. If you’re new to archery choosing the right target can be confusing—especially if you aren’t sure what exactly to look for. For starters, know this: The right one must be able to withstand numerous arrows flying its way without wearing out easily. Additionally, it should be user friendly. This means pulling an arrow out should be as easy as possible. These are just some of the many factors you need to consider before choosing one. With that said, if you’re still unsure which one to buy, have a look at our mini review that will make it easier for you. We discuss the most popular archery targets on the market so you can pick one for you. Here we have a product designed with young archers in mind. This is a good archery target to go with for beginners to get some good practice in. To be clear, this is an archery target meant for youths, one that is only ideal for bows with a draw weight 40 pounds or less. Any bow with a heavier draw weight will demolish this target real fast. 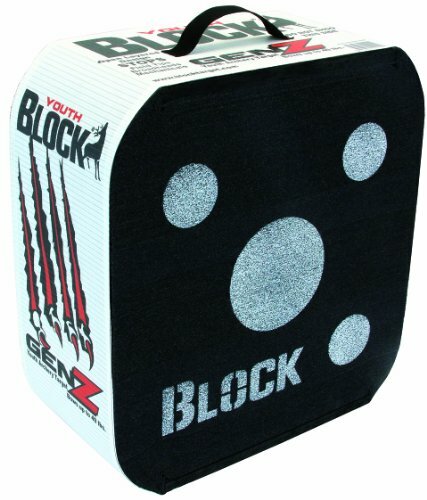 The Block GenZ Series Archery Target is designed to be lightweight and portable, plus it comes with a handle for easy carrying. The background on this target is black, with white high contrast aiming points for clear aiming and is designed to stop field tips, broadheads, and expandable points too. The open-layered technology makes arrow removal easy, especially for kids who don’t have too much muscle. 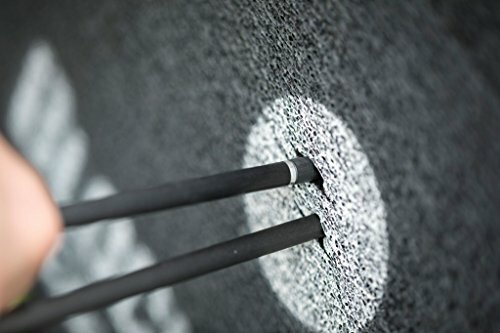 Arrows are easy to remove from this target thanks to its open layer technology. This means that your arrows are stopped by friction between the layers as opposed to force like most other targets. You can also expect it to last considerably long because it can handle most arrow tips. It features white on black aiming points which ensure clear visibility from any distance. Also, the high-contrast points allow your child to move from the larger to smaller aiming points. Your child can carry this target around with ease thanks to its handle. it’s perfectly sized; small enough to move with and big enough for a child to aim at. However it might tip over if the arrow hits the unit higher up. It’s wise to place something behind it to guarantee stability. Though it lasts long, once it starts wearing out it leaves quite a mess after each shooting session. 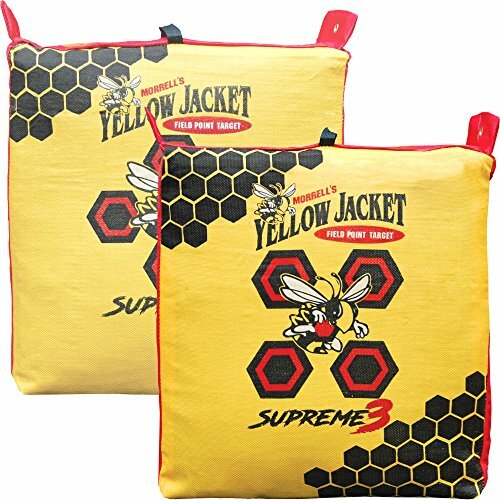 This target comes in 2 sizes, a smaller 16 inch version and a larger which is 22 inches. The smaller size is 16"Wx18"Hx8"D. The larger size measures 20"Wx22"Hx8"D.
The Morrell Yellow Jacket Archery Target is a very durable target, one that can handle lower draw weights of beginner recurve bows, and super-fast compound and crossbow arrows as well. This target can handle thousands of shots before it needs replacements, making it a very durable option. This target features lots of color contrast for the target points, making it easy for any archer to zero in on a specific spot. The Morrell Yellow Jacket Archery Target is also designed for easy arrow removal so you don’t have to strain your arm trying to wrench arrows out of it. It is worth mentioning that the Morrell Yellow Jacket Archery Target is made in the US, as American-made products tend to be higher quality than products made overseas. This target is not super lightweight, but still lightweight enough to carry and place with ease, thanks to the nifty handle on the top. It also features grommets on the top, so you can hang it up as well, although this is not all that easy to do. One thing to note here is that the Morrell Yellow Jacket Archery Target is made for field points only. This shooting target is designed to withstand numerous shots from compound bows. It allows you to remove an arrow by using just two fingers. Once it wears out you have the option of replacing the cover, making it brand new again. It comes with a carrying handle for easy transporting. You can decide to use it as a free standing target by simply hanging it thanks to the grommets. It’s recommended for the advanced archer who wants to shoot many arrows at it. In addition, the design allows for easy and clear visibility during your target practice. However some customers have noted after a while it leaves a residue which resembles glue on the arrows. Not only is this residue difficult to clean but the arrows become difficult to pull out. The targets are available in packs from 1 to 5 according to Amazon but when we last checked, it was cheaper to buy the individual packs. The packs with multiple targets were more expensive but it's worth checking if you are looking at purchasing several. The full size version of the youth target we reviewed earlier, this is the best two sided archery target on the market. It’s available in three sizes to increase your chances of getting the right size for you and is specially designed to stop arrows using friction instead of force. While it does a great job at stopping arrows, it won’t ruin them due to high impact strikes. The open layer design helps to keep arrows intact upon impact, plus it helps the Block Classic Archery Target itself stay intact longer as well. 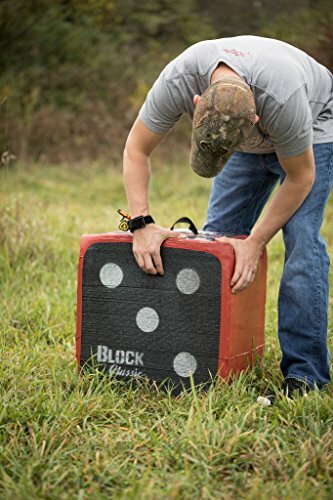 Once again, we do have to mention that the Block Classic Archery Target is made in the US, as US-made products usually have high-quality standards. This is a two-sided archery target block, so once the first side wears through, you can turn it around and use the other side. The high-contrast aiming points are easy to spot, another benefit. The open-layer design allows for easy removal of the arrow. It features white on black points to increase visibility when aiming. In addition, this high-contrast design ensures you measure accurately during your target practice. Like most archery targets it comes with a handle making it very portable. Though it’s durable you might want to avoid hitting its edges. Constantly doing so will prematurely cut the band that holds the layers together. Sure, it’s on the expensive side but it’s built well and works as expected. Also, it can handle compound arrows. Unfortunately, you may need to clean your arrows after every shot as the foam sometimes sticks to the arrow. Also broad heads will quickly wear out the foam. It’s advisable to keep it stored away from harsh weather elements as they may reduce its longevity. The Block Classic Archery Target comes in 3 sizes which includes an 18 inch, 20 inch, and 22 inch models. The less advanced of an archer you are, the larger the target you should pick. Unlike the previous items on this list, this is not an archery block, but your classic paper bulls eye targets. These are printed to exact official standards, which is good for tournament preparation. There are various options to go with here including 15 ring, 10 ring, 5 ring, not to mention that you can get them in 40 and 80 cm sizes. These are paper targets, but this is archery paper that has been specially designed to limit hole size for longer lasting use. Of course, you do need to back these targets with a block or wood to stop arrows from flying right through the other side. This archery target features the traditional bull’s eye design. They’re made of heavy duty paper making them durable. The targets are printed in accordance with the strict archery standards: 40 and 80 cm thickness. The 40 cm targets are printed on seven-point archery paper while the 80 cm ones are printed on either seven- or ten-point paper. The colors are bright for easy aiming even for distances as far as 60 yards. Generally the archery targets work well and are made of high-quality paper. However it’s advisable for use with arrows with lower draw weight for instance 24 lbs. You can buy them in bulk which will be cheaper than individual purchases. 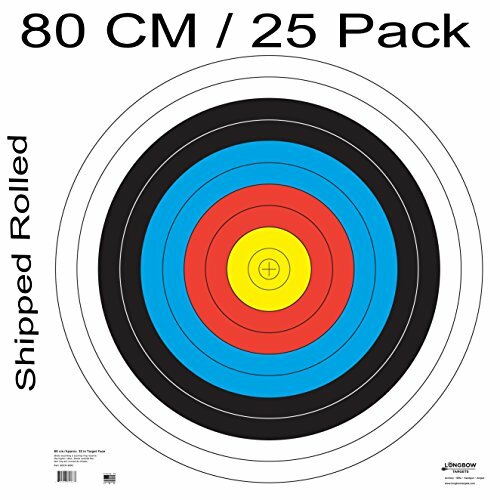 The 40 cm targets are packed in 8, 20, 50 and 200 packs. Apart from archery these targets can be used for gun shooting. his Hurricane archery target features highly visible aiming points. The bright orange centers are easily seen against the equally brightly colored background. 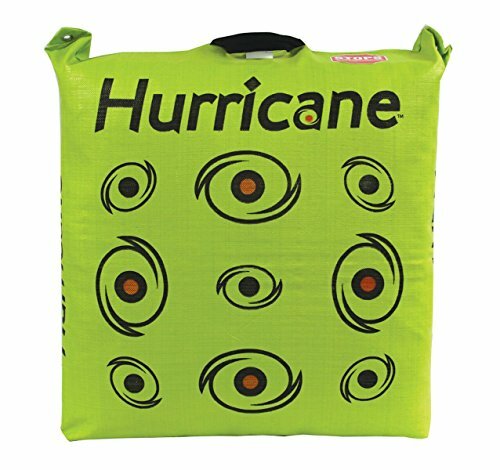 The Hurricane Bag is a really neat choice to go with, one that is ideal for all kinds of training. What is really neat about this thing is that one side features deer vitals points, which helps when practicing targeting for deer with your bow. The front side also has aiming points, making this a dual-sided target. However, the front and rear aiming points do not line up, which helps you get more life out of this target. The high-contrast aiming points are very easy to see. Although the Hurricane Bag Archery Target is not super lightweight, it is highly portable thanks to the heavy-duty handle it comes with. It even features grommets, so you can hang it up if you would prefer to practice that way. It is recommended that you use the grommets, as this target is not terribly stable when standing on its own. The Tri-core 1000 PSI tech used here is very durable and it can stop pass-throughs from most bows and arrows. The deer vitals located at the back of the archery target allow for an easy hunting practice. It has a heavy-duty handle to transport it around with ease. It’s designed to withstand the pressure of hundreds of arrows and the material won’t wear out prematurely. This target is stable enough to handle the weight of an arrow’s impact without tipping over. It works well even if you’re shooting from as far as 75 yards. However we wouldn’t recommend using this particular product with broad heads; the blades will just cut up the bag. Rather use it for field points as the blades will be less invasive. This target comes in 3 sizes, from a 20 inch version up to a 28 inch version. The smallest size is 20"Wx20"Hx10"D. The next size measures 25"Wx23"Hx12"D and the largest size is 28"Wx28"Hx12"D.
If we only had to choose one, we would go with the Morrel Yellow Jacket Archery Target. Apart from being durable this product makes it very easy to remove any stuck arrows. It’s stable and the best feature has to be its replaceable cover. Now that you’ve got all the information can you confidently select the right one? If you have and advice for others, please leave it in the comments below.